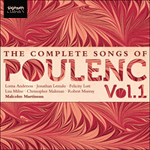 This is the only one of Poulenc’s Apollinaire settings to be taken from the collection Alcools (1913). Apart from a tiny fragment from Le bestiaire—a pièce d’occasion—this is Poulenc’s farewell to the poet who had played such a crucial part in his life as a song composer. 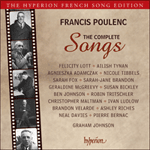 The setting unfolds gently and persuasively—at this stage of his career Poulenc was an absolute master of unforced wistfulness. As the song was given its first performance in Amsterdam in October 1954, the composer may well have chosen to set this poem with that occasion in mind. The title is perhaps related to the mistress of the English Plantagenet King, Henry II, the same Rosemonde who inspired the similarly mysterious Duparc setting Le manoir de Rosemonde; Apollinaire was so well-read in medieval history that it may refer to another famous Rosemonde—this time from Lombardy. There could of course have been a real Rosemonde at some point in the poet’s life (not one of the famously documented lovers), or the name could even refer to Schubert’s Rosamunde D797—bearing in mind that this composer was Apollinaire’s favourite above all others.